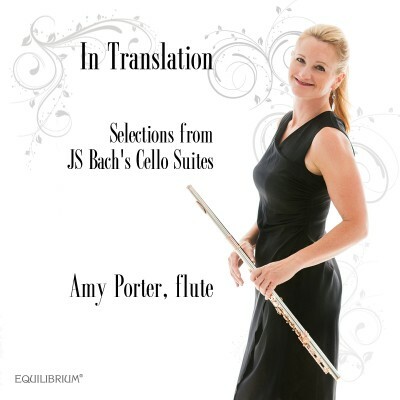 Flutist AMY PORTER captivates audiences with her stunning virtuosity combined with heartfelt lyricism and interpretive sensitivity in this double disc CD. Acclaimed by the New York Times as "a particularly strong performer, technically robust and musically forceful", and echoed by American Record Guide as "a charismatic and highly skilled performer", she has established herself as one of the leading artists of today through her innovative solo concerts and notable collaborations with the world's top composers. "It has been my practice to teach the solo music of J.S. Bach to my flute students, unrelentingly. They benefit from the form, implied harmonies, and the complicated yet simple nature of the music's technical content. They learn the broad spectrum of Bach's works and are transformed as musicians after working within his repertoire. Flutists have only "Partita in A minor" to proclaim as a solo work written authentically by J.S. Bach for the flute. Flute teachers often use melodies of J.S. Bach from other sources as a means of drawing students closer to his mastery and genius. My experience with teaching J.S. Bach and playing his chamber music is deeply influenced by the brilliant mind of my flute teacher Samuel Baron and his Bach Aria Group. Other influences include listening to masters of the transverse flute, keyboard, and strings. I began learning the Cello Suites at the suggestion of Boston flutist and cellist Tim Taranella, playing from the edition in treble clef given to me by Professor Paul Meisen. In 2005, Professor Meisen and I both served on the jury of the Kobe International Flute Competition, where he delivered a lecture in German, translated into Japanese, on the Bach Partita and Cello Suites. His lecture compared the two works and offered a contrasting cello performance of Bach's "Partita in A minor". Mesmerized by Professor Meisen's 2005 lecture, I began the journey of learning the Cello Suites in earnest." — A.P.